This was a six day cruise calling at Amber Cove and La Semana in the Dominican Republic as well as Holland America's private island Half Moon Cay in the Bahamas. The original itinerary had included San Juan, Puerto Rico but that port was cancelled due to the damage done to it by the 2017 hurricanes. 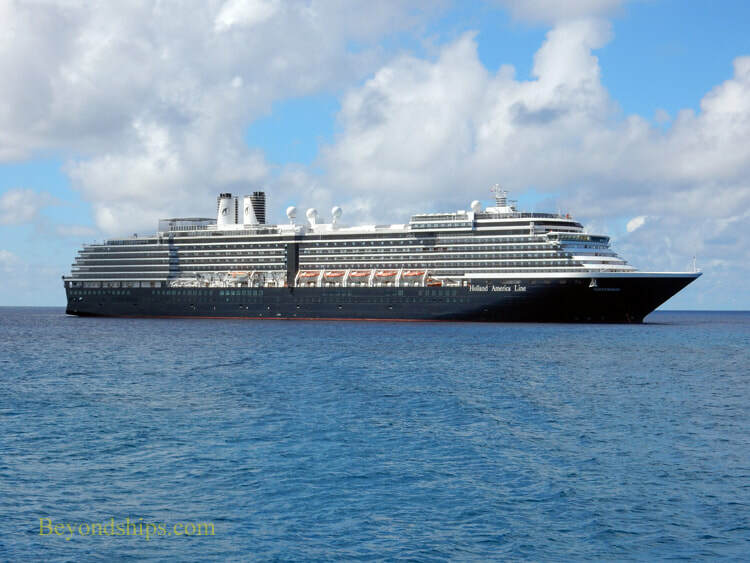 Oosterdam was the third dhip built in Holland America's Vista class. (See also profiles of sister ships are Zuiderdam, Westerdam and Noordam). However, the ship was given an extensive refit in 2016. It is readily apparent from the public areas that this ship is a premium cruise ship. The décor is contemporary but upmarket. Museum quality art mixes with relaxed lighting. Oosterdam is not about glitz nor is it out to shook anyone. This is consistent with the ship's passenger demographics. Passengers tend to be educated and appreciative of the ship's cultural offerings. Despite being a relatively short cruise, there were few families with children aboard. Rather, the typical passenger was retired. Most passengers were from North America. Passengers on Oosterdam have a lot of activities to choose from. The ship has the standard features of a cruise ship including two pools, hot tubs and sports facilities. However, there are also classes going on, films showing, quizes and games. Unlike most cruise ships, Oosterdam has activities on days when the ship is in port as well as on days when she is at sea. (See interview with Entertainment Director). The classes aboard the ship included a series of talks and demonstrations about computers, the internet and technology by an expert affiliated with Microsoft. These were practical talks and despite the Microsoft connection covered issues relevant to guests who use other brands' technology. Along the same lines, Oosterdam had a series of cooking demonstrations done in partnership with America's Test Kitchen. These were very well attended. There was also programming done in association with Oprah Winfrey. This included a book club as well as a talk about the use of spices in healthy eating. The evening's entertainment also included brand names. The BB King Blues Club featured the BB King All Stars. This band played blues, Motown and soul favorites. However, they were a notch above the typical cruise ship band in quality. Similarly, many premium cruise ships have classical music ensembles. However, the Lincoln Center group on Oosterdam was once again above the ordinary. Like the BB King All Stars, the Lincoln Center group had its own dedicated venue each evening. Rounding out the brand name performers were a set of dueling pianists affiliated with Billboard magazine. To accommodate these performers, the walls separating the ship's original piano bar from the casino were removed during the 2016 refit so that the pianists are in one large room with the casino and a bar. In so doing, the ship lost the intimacy of its piano bar where guests were able to sit around the piano and chat with the performer. Also, the music carries up the forward staircase and can be heard in the movie screening room one deck above. ​In addition to the brand name live entertainment, Oosterdam has its own production cast. These singers and dancers perform in the ship's theater, which now has LED screens to provide backdrops and scenery. On the nights when there was no production show, there were shows by visiting comedians. As mentioned earlier, the ship presents recent movies throughout the day in an intimate screening room. If these films do not trigger your interest, there is a large selection of complimentary movies and television shows (e.g. Downtown Abbey, Game of Thrones) that you can watch on the large flatscreen televisions in the staterooms. All in all, we were impressed by the entertainment offerings on Oosterdam. We aslo thought the dining on Oosterdam was above average. (See separate review). Another impressive feature about Oosterdam was the attitude of the rank and file crew. Everyone we encountered seemed genuinely happy to be there. This translated into a desire to make sure that the passengers were happy to be there as well. Oosterdam is a mid-size ship. As such, she is relatively easy to get around. However, she is large enough so that you do not see the same people over and over. During this voyage, the ship encountered some stormy weather. This caused the ship to move but most of the passengers were out and about nevertheless. Of the three ports, Half Moon Cay was the most popular. Although it is a tender port, most of the passengers went ashore for a day at the beach. Amber Cove is a cruise village developed by Carnival Corporation that includes shops, bars a large swimming pool and various entertainment options such as zip lines. It is similar to the cruise villages at Mahagony Bya, Roatan and at Grand Turk. Pretty but artifical. ​La Semana was added as a port to replace San Juan. However, it is a small town that is not used to having, as on this occasion, two cruise ships in port. It is a tender port with some distance between the ships and shore.